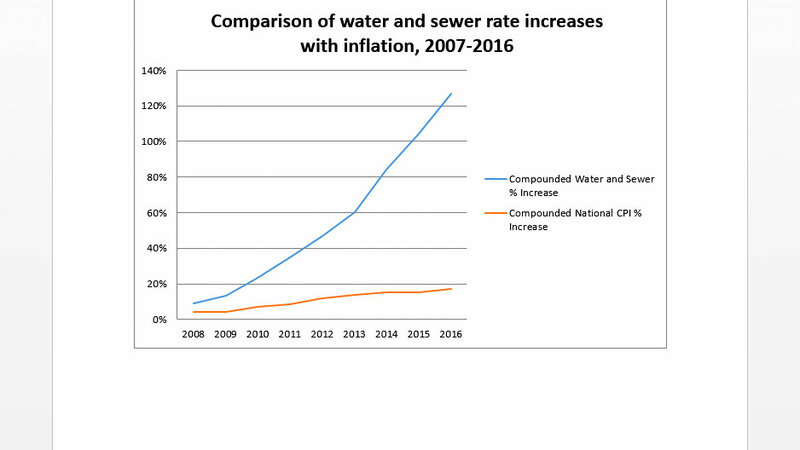 Above: Baltimore’s water and sewer rate increases compared to inflation, from the Abell Foundation report. Programs designed to protect Baltimore’s poor and elderly citizens from drastically increasing water and sewer rates are “improving,” but remain “deficient and inefficient,” says the author of a new study commissioned by the Abell Foundation. “Nothing they are doing or promise to consider will ease the simple truth that people just can’t afford these rates,” said Joan Jacobson, whose report, “Keeping the Water On,” is being released today. As a result, Baltimore’s most vulnerable residents are faced with water cut-offs, billing errors, tax liens, tax sales, homelessness and more. This leaves Jacobson wondering how city leaders could have failed to anticipate the fallout from rapidly increasing water rates in a city where 25% of citizens live below the poverty line. The data she cites show how customers are already hit by the soaring bills. Last May, according to her study, there were 24,862 residential water customers behind on their water and sewer bills – about 15% of all residential customers in the city. Collectively, these overdue customers owed more than $20 million. These were customers who had fallen behind before Baltimore’s new water and sewer rates took effect last month – hikes which will increase bills to close to 30% over the next three years. In the previous decade, there was a 127% rise in city rates. “These increases exceed the rate of inflation by more than seven times,” according to the study. Other cities have also raised the price of water and sewage under federal mandates to stop polluting waterways and causing basement back-ups. Jacobson found that Baltimore’s water rates sit in the middle of the pack when compared to other cities. The annual bill in January 2015 for a household using 60,000 gallons of water a year was $327.41 – a rate higher than New York City ($296.77), but lower than Philadelphia ($390.73). Along with statistics, the report includes case studies showing the Third World conditions suffered by city residents without water. Among them is the story of a 17-year-old girl who lived in a Harlem Park apartment for five months without running water. She thought constantly about wanting to “be clean, to stay clean and smell clean,” she told Jacobson. The girl relived herself in kitchen pots lined with plastic bags, got water in jugs from the corner store and sneaked down an alley to take water from hose spigots. “I was angry, ready to fight anybody,” she said. Department of Public Works officials said they had not seen a final draft of the report and did not respond to a request for comment from The Brew. DPW Director Rudolph S. Chow, who served for three years as chief of the water bureau, declined to be interviewed for the Abell study. He instead submitted a brief written statement in which he defended shut-offs. • A new water metering system that allows DPW and customers to monitor hourly water usage to see if there is a leak. • Elimination of a mandatory minimum fee that overcharged thousands of thrifty customers (and owners of vacant properties) by charging them $425 a year, as if they’d used nearly 30,000 gallons of water. • Ending a discount for industries that use large amounts of water. • Posting a little-known medical waiver, which can prevent a turnoff with a doctor’s note, on the DPW website so people could actually find out about it. What’s more, the city has changed its practice of shutting off water to landlords with large buildings. DPW is now suing the landlords for nonpayment, so tenants don’t find themselves without water through no fault of their own. The agency had found cases of landlords ripping off “turnoff notices” as soon as they were posted on a property. The city, for example, increased the Low Income Water Assistance Program credit from $170 to $197 a year, she notes. But under a new repayment plan for overdue bills, if a customer chooses the plan with no down payment, they are no longer eligible for the credit. The Senior Citizen Water Discount Program is offered to customers age 65 or older with annual incomes of $30,000 or less. But the program still requires most participants to pay annual fees for stormwater and Chesapeake Bay restoration. The Abell report notes the gap between the number of participants in these programs (2,645 seniors and 2,433 other low-income participants) and the more than 25,000 city households who are deemed eligible for the state’s energy assistance program. Automatically linking the programs could ensure that more needy customers get help so they do not risk losing their homes. The report reviews other cities’ approaches to help low-income residents. It urges Baltimore to consider a steep discount for the first 5,000 or 10,000 gallons of water used for a set period of time as well as “income-affordability strategies” like those being pioneered in Philadelphia. A measure approved by Philadelphia leaders last year mandates that water bills for residential customers living near the poverty line be “affordable” based on a percentage of household income. That city also has taken a different approach to tax liens. In Baltimore, a homeowner with more than $750 in unpaid water bills can lose his property. Philadelphia has no legal threshold of unpaid bills that will trigger a tax sale. The city typically seeks to foreclose upon a residential property for unpaid water bills if the lien exceeds $5,000. The stakes couldn’t be higher for Baltimore’s low-income homeowners, according to the Abell report. Between 2014 and 2015, the number of city homes sold at tax sale with water-only liens rose by 34%, from 671 to 902. The study recommends Baltimore eliminate water liens at tax sale altogether. Federal HIV contracts have been a mainstay for Associated Black Charities, which is under scrutiny because of its involvement in Healthy Holly book sales.